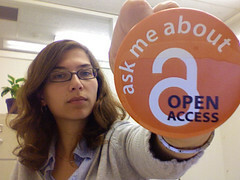 Open Access (OA) publishing aims to make the results of scientific research available to the widest possible audience. Scientific papers that are published in Open Access journals are freely available for crucial data mining and for anyone or anything to read, wherever they may be. But there is still a long way to go yet, as much of the world’s scientific knowledge remains locked up behind publisher’s paywalls, unavailable for re-use by text-mining software and inaccessible to the public, who often funded the research through taxation. Ironically, some of the papers that are inaccessible discuss or even champion the very Open Access movement itself. Sometimes the lack of access is deliberate, other times accidental – but the consequences are serious. Whether deliberate or accidental, restricted access to public scientific knowledge is slowing scientific progress . Sometimes the best way to make a serious point is to have a laugh and joke about it. This is what the Open Access Irony Awards do, by gathering all the offenders in one place, we can laugh and make a serious point at the same time by naming and shaming the papers in question. Serial offender and über-journal Science has an article by Elias Zerhouni on the NIH public access policy  (Subscribe/Join AAAS to View Full Text), another on “making data maximally available”  (Subscribe/Join AAAS to View Full Text) and another on a high profile advocate of open science  (Buy Access to This Article to View Full Text) Irony of ironies. The “green” road to Open Access publishing involves authors uploading their manuscript to self-archive the data in some kind of public repository. But there are many social, political and technical barriers to this, and they have been well documented . You could find out about them in this paper , but it appears that the author hasn’t self-archived the paper or taken the “gold” road and pulished in an Open Access journal. Ironic? Last, but not least, it would be interesting to know what commercial publishers make of all this text-mining magic in Science , but we would have to pay $24 to find out. Ironic? These are just a small selection from amongst many. 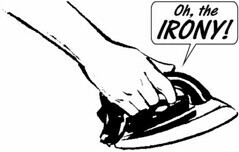 If you would like to nominate a paper for an Open Access Irony Award, simply post it to the group on Citeulike or group on Mendeley. Please feel free to start your own group elsewhere if you’re not on Citeulike or Mendeley. The name of this award probably originated from an idea Jonathan Eisen, picked up by Joe Dunckley and Matthew Cockerill at BioMed Central (see tweet below). So thanks to them for the inspiration. For added ironic amusement, take a screenshot of the offending article and post it to the Flickr group. Sometimes the shame is too much, and articles are retrospectively made open access so a screenshot will preserve the irony. Join us in poking fun at the crazy business of academic publishing, while making a serious point about the lack of Open Access to scientific data. MT “@dullhunk Open Access Irony Awards: http://t.co/VlBS4eZ4 @bmcmatt @phylogenomics @PLoS @steinsky #openaccess” <- #BMJ research is OA! @dullhunk I entirely agree with concept of #OA irony but many of the examples were journalistic – perhaps a bit unfair?